Is it Two or Three? 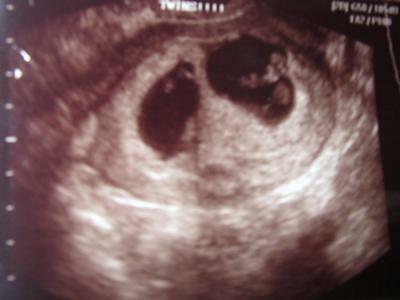 I was 9 weeks in this ultrasound. They said it was twins but I see a spot on the bottom what is it? Two or Three? I am going to the parentalogist on the 24th of June (2010) to get a cerclage anyone have any advice? I also have a 14 month old daughter. Comments for Is it Two or Three?